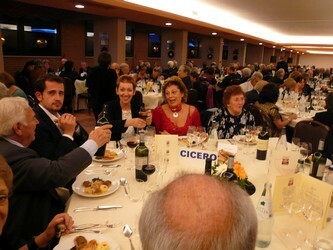 The 34th Raduno of the Mai Tacli was held on the 19-20th May, 2007 at the Hotel Gio in Perugia. 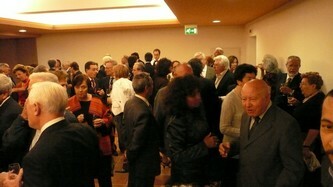 It was attended by about 350 delegates coming from various parts of the globe. 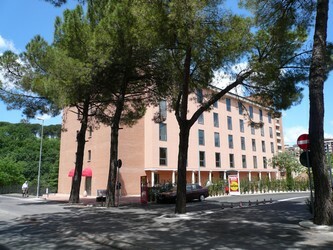 The Hotel, composed of two Units linked underground with a Tunnel decorated in Musical style, was a first class establishment famous in the region for its impecable standards, excellent wines and first class Umbrian Cuisine. 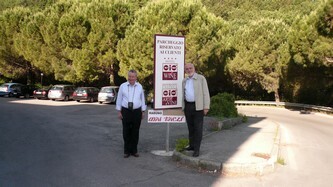 Arriving at the Hotel, right by the entrance Costas and Giorgio stand by the MAI TACLI 'Welcome Poster'. Arrival 18th May. 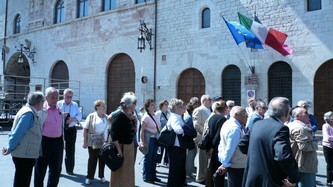 First stop and a sampling of Umbrian Espresso coffee! Bags and rooms sorted and its out to the restaurant. 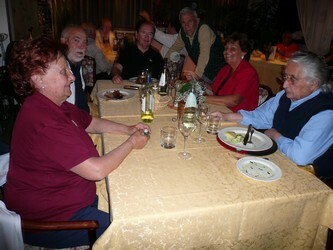 There we find Father Protasio and Marcelo Melani with Wania Massini and their friends. 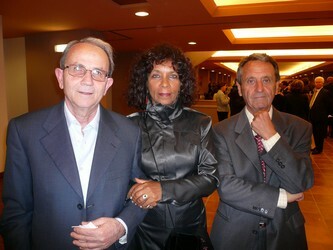 Next to them is Zanoti and his wife. 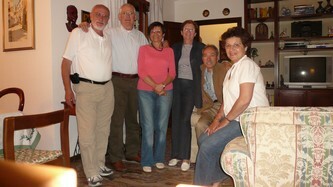 Afriend that I had not seen so many years.....Acquadro and his family. 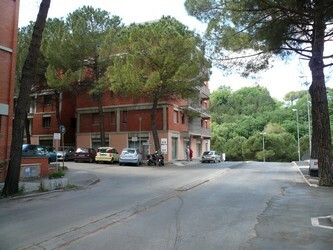 He used to repair by bicycle at Asmara when he had the shop near the 'Piazza della Posta'. 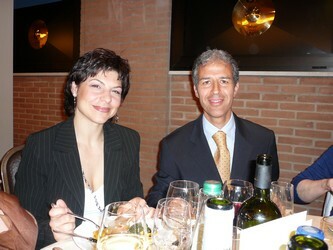 Massimo and Nadia Fenili. Friends who never miss the Mai Tacli meetings. 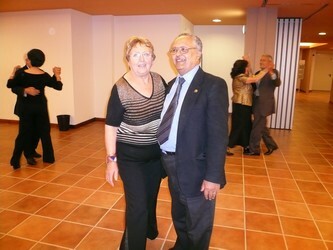 A veteran in Bowling, he still runs the Bowling Center at Viareggio. 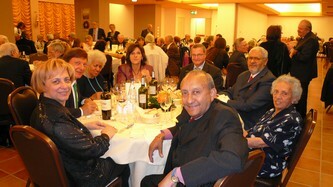 Time was spent meeting friends and socialising with new and old. People one new at Asmara but never frequented for one reason or another suddenly become 'friends' linked by the nostalgia and happy memories of Eritrea. 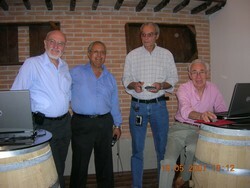 Lombardo seen here with friends used to race cars and now still works as head mechanic for BMW at Lucca. New computer wizz kids on the loose!. 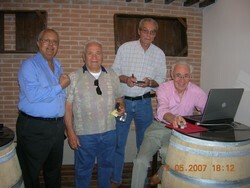 Vassili Kyriakakis all the way from Ancona with Costas and friends. 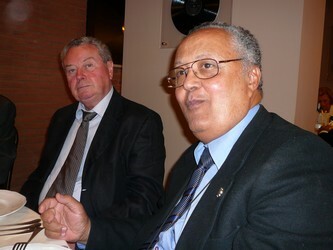 All the way from Ancona, Vassili Kyriakakis used to work at Massawa with Tolio Panas. 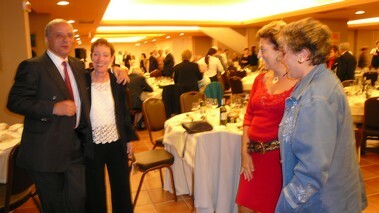 Here with friends he entertained and made happy with his off the cuff tricks and jokes! Dinner was preceeded by Coctails and Champagne. 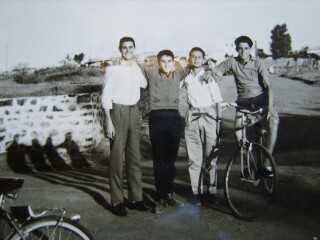 Seen last time as a young kids in Asmara, Corbezzolo and Pastacaldi. 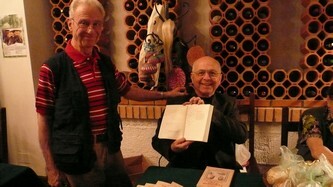 Marcello Melani and Father Protasio were the centre of attraction. The former as the organiser of the evening and the later as the person responsible for the building of the School at Massawa. 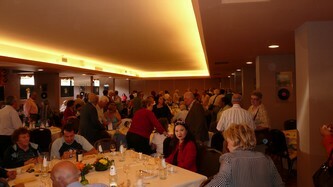 A view of the people getting ready for dinner. 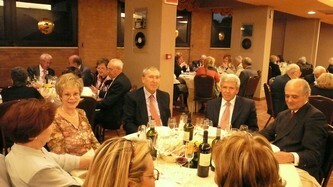 Giorgio and Angela Sfiligoi and their friends. Ardent supporters of the Mai Tacli Raduni. 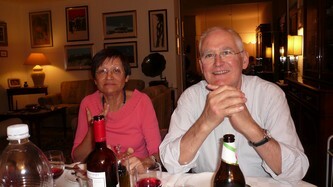 Seen here with a younger generation of friends... Anna Maria and Roberto Tozzi. I cant remember the name. 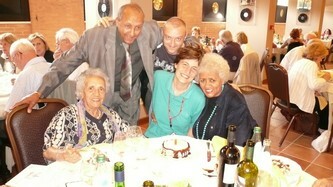 This lady was a famous doctor in Asmara ! All the way from Imola. 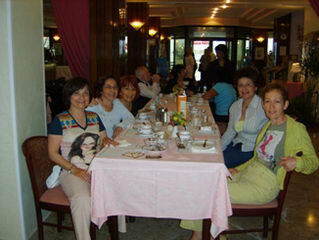 Silvana Molinari and Anna Guidara at table with friends.. The Tringali family(famous for printing works in Asmara) had a whole group of their own. 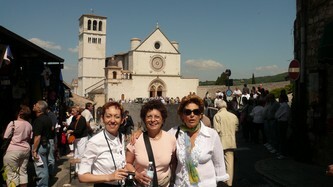 Attending for the first time, Anna Maria seen with Angela Sfiligoi. A wonderful new couple! 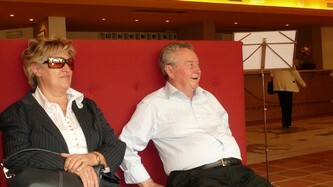 Anna Maria and Roberto Tozzi. 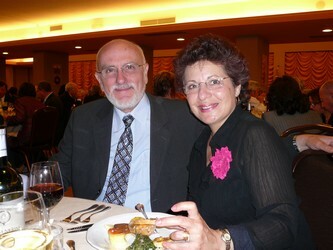 Musicisian extraordinaire Ugo and his lovely wife Silvana. 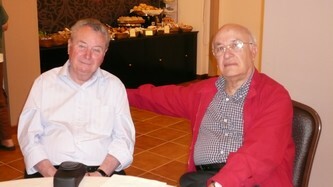 Two ex Massawinis Giorgio Sfiligoi and Vassili Kyriakakis. All the way from London and a sponsor for the 'St.Francis School at Massawa' Costas and Sophie Stylianidis. 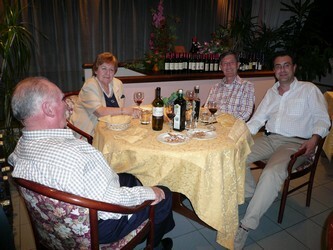 Only a month before this 'Raduno' Costas and Vassili had met at Patras and had a wonderful journey to Ancona together! 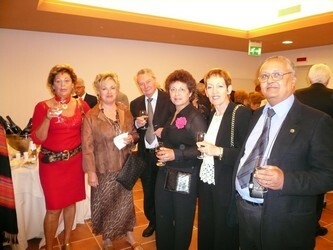 Giancarla Viccino and friends. It was so good to see you all again! 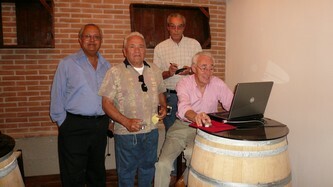 Giggino Amarante and his group. 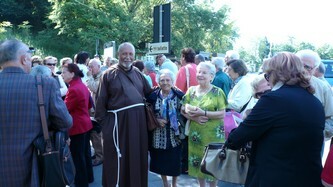 Frequent attendants of the Mai Tacli Radunni. 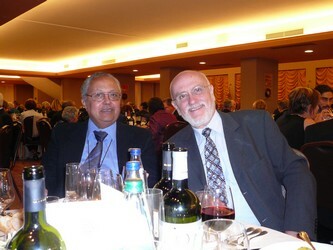 A good friend and neighbour from Asmara... Degg. Aberra Hailu Street, as it was known! 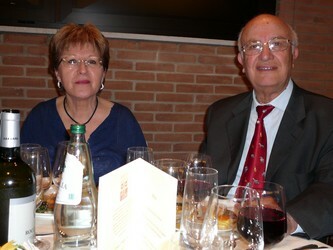 Marcello Melani is the organiser of the Mai Tacli Radunni and editor of the paper with the same name. 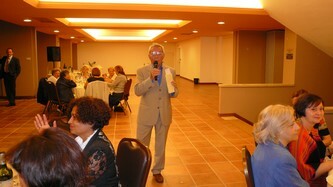 Here he is welcoming everyone and thanking them for attending this happy occasion. Not looking a day older.... my friend Acquadro and family attending for the first time after a long break. Talking about veterans of the Mai Tacli! My friend Giovalsco can certainly qualify for that! Dedicated and committed to the cause Lisa Cahan and sister all the way from Tel Aviv. 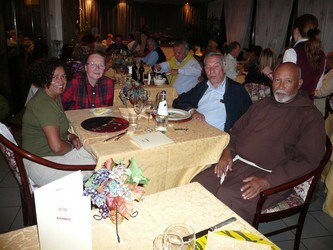 Father Protasio and Vassili and friends. 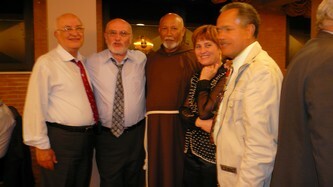 Father Protasio and Costas Stylianidis with friends. 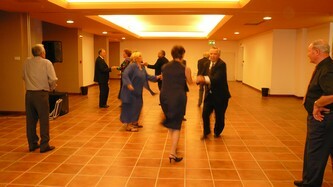 Soon after dinner dancing started with music and dances of the 60s such as the Twist and Hully Gully! Two estraordinary dancers Mieta Alpi and Vassilis Kyriakakis. Friends posing for a quick picture. Old friends? friends for ever... Ugo and Giorgio. 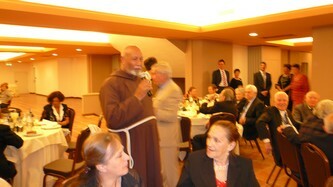 The School currently been built at Massawa is dedicated to St. Francis of Assisi. 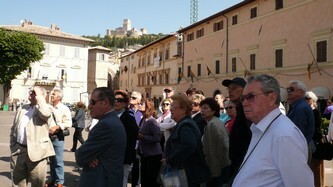 Perugia being so near Assisi, on sunday we arranged with Father Protasio to go to Assisi where he served Mass in one of the Chapels. Here he is seen welcoming the group as they arrive by coach. 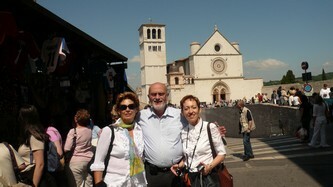 Three friends in front of the wonderful views of the Basilica of St. Francis. Built in honour of the person who gave up all his wealth for the wellfare of others, this Basilica is frequented by millions of worshippers every year! 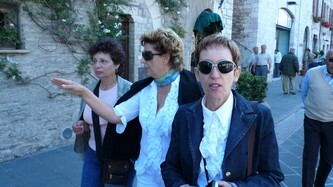 Mai Tacli had arranged for two local professional guides to meet us and assist us during the tour of the Monastery. 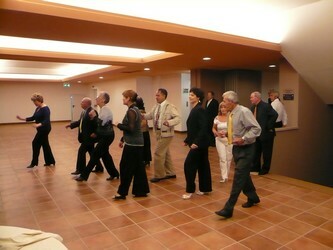 Back to the Hotel after Mass, lunch with friends followed by the good byes from all those who were departing to their destinations. 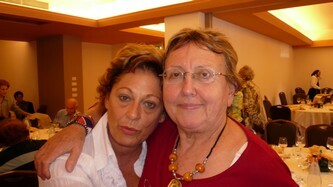 School mates together.One from Tel Aviv the other from Imola! If I recall this was a wonderful surprise visit from a Grandaughter on someones birthday? 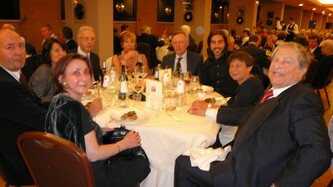 Once again Massimo with happy and smiling friends. ....as if no time had gone by. 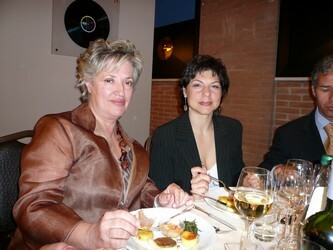 Anna Guidara and Mieta Alpi. They were there to meet us at the airport on arrival, they were there to take us to the Train Station.... Giorgio and Angela Sfiligoi... Thank you! 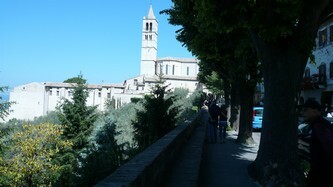 We had a brief trip to Perugia famous for its 'Perugina Chocholates'. 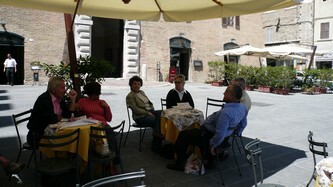 Here during a coffe break Marcello Melani, Giorgio Sfiligoi and some other friends. I could not have gone to the Mai Tacli Raduno and not gone to meet my friend Adriano who now lives in Rome and was unable to attend the meeting. 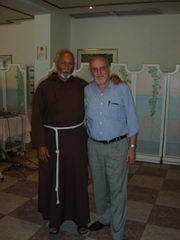 Adriano and I used to go to Comboni College at Asmara and the last time I saw him in Rome was in 1967. 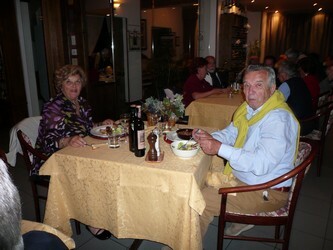 Now married with Rita and retired from Alitalia they were our hosts for a 'Zighini Dinner'. Friends of my friends are MY FRIENDS ! 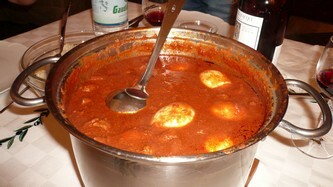 The 'masterpice' cooked by Adriano himself. 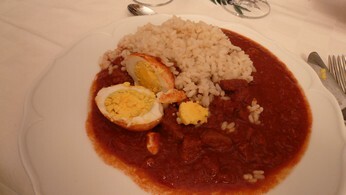 As I am a 'coeliac' I could not have zighini with Injera (unless it was made of pure teff). Here a substitute with Rice was just as enjoyable. A happy holiday snap received from my friend Lisa from Tel Aviv. Seems as though these cheerful Asmarini friends will never keep apart... 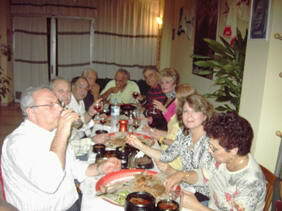 Here is a photograph taken on 18th January 2007 at the Lalibella Restaurant at Athens. Amongst the friends are George Mitsopoulos, Sia and Manolis Frangoulis, Kostas and Billy Nikoloudis and Apostolos Economou and Takis Christoforakis. Faces may change.. but the desire to meet with old friends never does! Here. 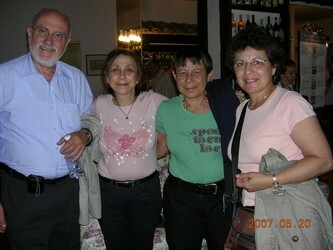 a few Greek Asmarini friends at a re-union in Athens in 2005. This is a regular occurence whenever a few of us happen to be in Athens at the same time. 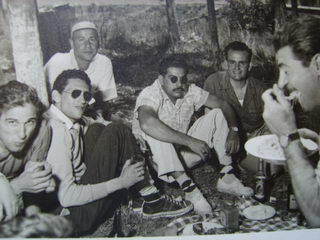 In the picture are George Mitsopoulos, Manolis Frangoulis, Vassilis Maltas, Nikola Maltas, Kostas Nikoloudis and wife, Nick Kyriakopoulos and wife, Sophie Stylianidis. 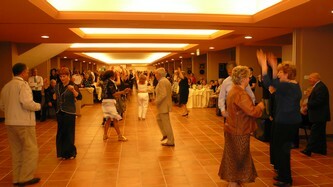 The venue was held at the 'Lalibella Restaurant' in Athens. The whole weekend was finally rewarded with meeting my good old friend Mario Tonellotto. 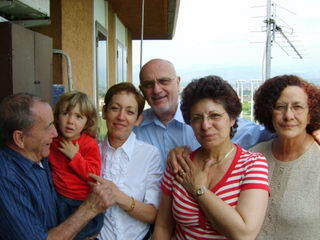 Now a grandfather living in Busolengo, we proudly posed for a photograph with his wife Loredana, his grand daughter Anthea, Silvana and my wife and me. I was looking for a friend that I had not seen for 40 years. 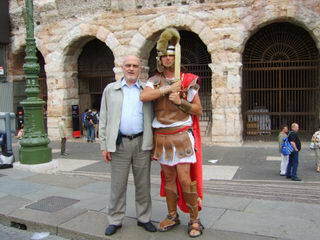 I was grateful however that this Roman soldier allowed me to be photographed next to him. 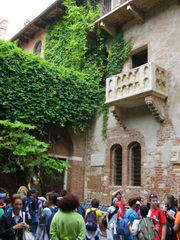 This was also a good opportunity to visit Verona, the home town of Shakespeares' Romeo and Juliet. I would not be short of a hair cut this time (not that I need one as I haven't got much to cut!). 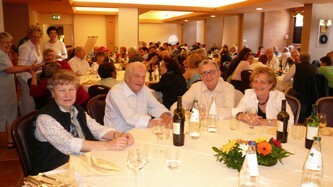 I was pleased to meet Renzo Viola and my friend Pino Bruni and their families. Both of them were barbers in Asmara. 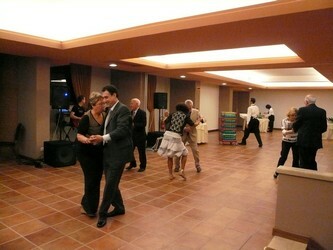 Renzo played the drums and Pino the accordeon. Many a time did we go serenading our beloved girls. How romantic and how innocent! Romeo and Juliet in the making, but Juliet never seemed to appear! Ah ha..!!! 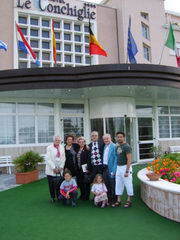 This picture was taken at Riccione at the forecourt of the Le Conchiglie Hotel. A friendly Basketball game at Kagnew Station was a 'treat' .. Here with some students from Comboni College.. Do you recognise yourselves? 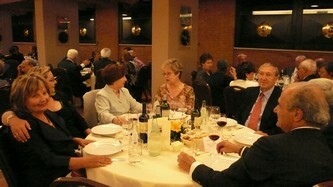 13th May,2006 both the Chichingiolo and the Mai Tacli Conventions were held on the same date.The Chichingiolo gathering was held at Rimini whilst the Mai Tacli was held at Riccione a few miles down the coast. We flew to Forli on saturday morning where we were met by our good old friend Silvana had come to collect us and drive us to Rimini. 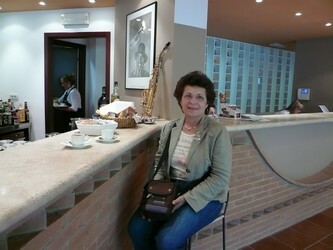 By midday Asmarini had started checking in at the Hotel. Once we unpacked and settled in our confortable rooms we went to a Fish Restaurant along the beach opposite the Hotel for a quick bite to eat. In Italy there can never be a 'quick bite' as such because once you see what is in the menu and smell those beautiful aromas and specialities there is only one thing you do. EAT!!!! 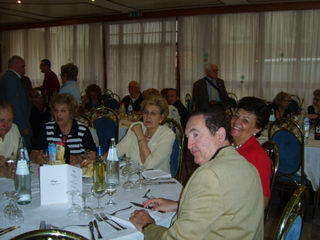 In this picture Silvana Molinari is seen with Sophie Stylianidis, Francesco De Leonardis and ?? 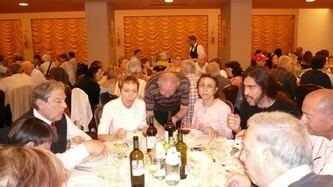 A little siesta in the afternoon to recover our energy and soon it was time for the evening function. 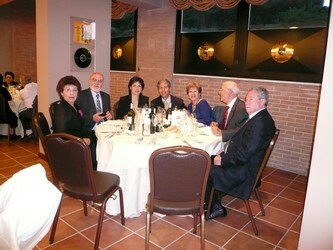 An aperitif preceeded dinner with the usual group photographs and happy exchanges of love and nostalgia. Girls that met again after the previous meeting, friends that came from England, Israel, Nigeria, Dubai and of course all over Italy. Memories of happy days gone by but above all a general feeling of love for Asmara, for Eritrea and for the people struggling through their present difficulties and a general desire to help those who are in need today. I heard of people helping through various schemes such as the Building of the School at Massawa, or the adopting of individual Eritrean Students for their education through University. All of them being equally rewarding. 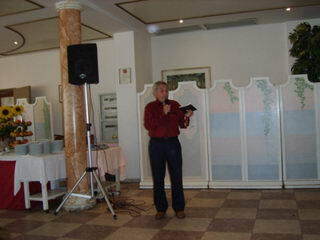 Francesco De Leonardis, the Organiser of the Chichingiolo re-union and editor of the website with the same name, was there to meet and greet everyone and ensure that everyone was happy. His hard work and attention to all detail were the main contributing factors for the great success of the 'Radunno'.Nothing was spared for the night.. not even the supply of some 'chichingioli' and 'baobab' fruit, which were imported especially for us to sample as in the good old school days! 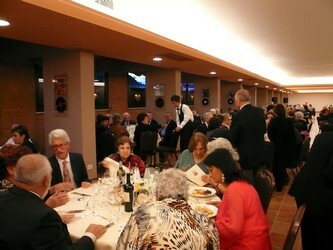 As the evening started and the soft music played we all sat at our tables in our own little groups. 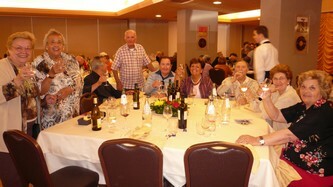 Wine was good and plentiful and so was the spirit to have a good time together. The evening was also graced by the presence of a young 'Asmarina' called Anna Denadai. 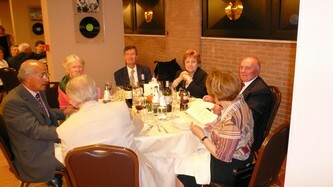 Her contribution for the occasion was to donate a couple of her own oil paintings which were raffled soon after dinner. Anna is an excellent artist. 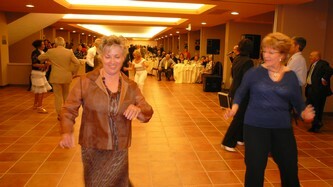 We all admired her talent and felt proud to share her presence amongst us. 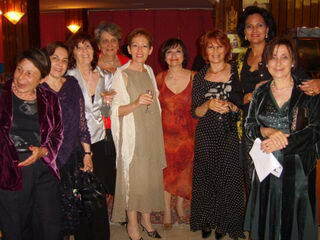 Silvana Molinari, Adriana Spina, Sophie Stylianidis, Guella Tarablus e Bruna Cassani sharing a moment together. 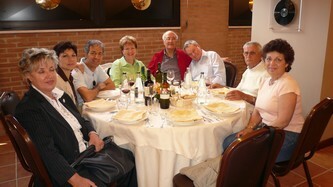 At the same time as the Chichingiolo re-union in Rimini, Mai Tacli (the old boys) were having their own re-union at Riccione. Normally one meeting is held a week earlier than the other. 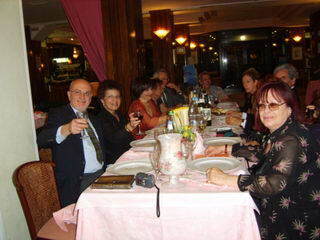 However I wanted to go and meet all my other friends there too.. so on the sunday we drove to 'Le Conchilie'in Riccione and joined them at the Mai Tacli lunch. It will be nice if in the future both meetings are held in ONE location. 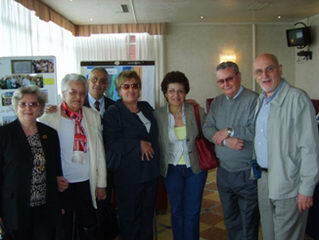 In my view there is only ONE group of Asmarini and it would be easier for those who came from abroad if all of them met in the same venue and at the same time. 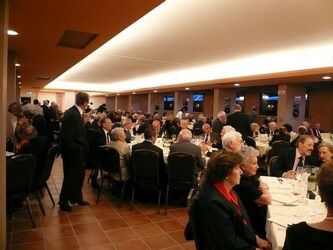 On the day of the lunch, Marcello Melani was first to announce that he would not mind sharing one venue with our friends at the Chichingiolo in the future. 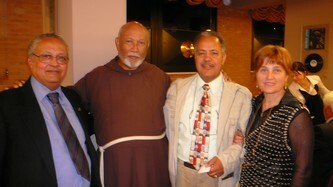 At the Mai Tacli re-union I was able to catch up also with Father Protasio who updated us with his progress with the School at Massawa. I was able to hand over the generous sum of 1000Euros which we have raised through 'My Baobab Appeal' and he is extremely grateful for everybody's generosity. Friends from Asmara and Massawa pose in this picture. 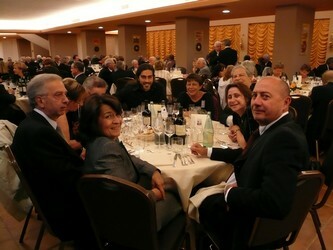 Amongst them Giorgio Sfiligoi and his wife Angela, Renzo Viola with his wife and sister and me with my wife Sophie. 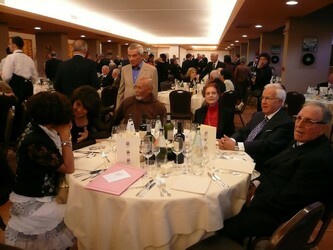 Massimo Fenili and his wife Nadia at the Mai Tacli lunch with other friends. 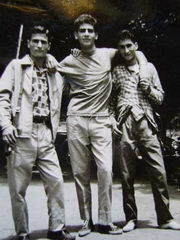 Memories of the 60s.. three friends on a day out at the Ertola farm in Keren!. 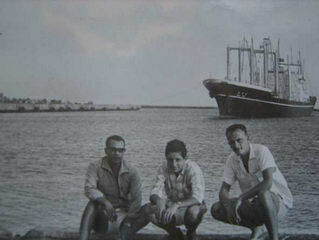 From the left Nicos Garoufalias, in the center Bill Apostolidis and on the right Stratos Garofalias. Picture was taken during a day outing to Ertolas Farm in Keren. 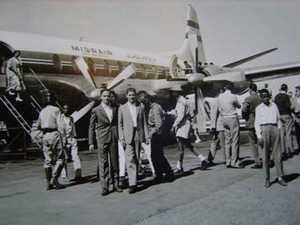 The day the first Turbo Prop flight of Misrair arrived in Asmara, the public was allowed to board the plane and have a look. Hundreds flocked to what used to be the old Asmara airport! The excitement of being allowed to board an airplane for the first time! 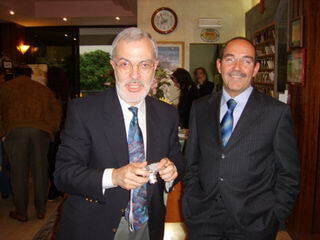 In this picture Costas Stylianidis and his friend Adriano Abrate pose for the picture. 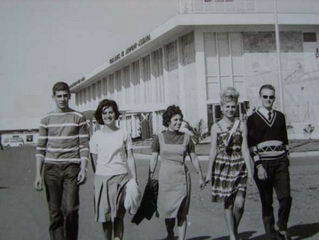 Early 60s.. the Airport at Asmara had just been built. It was a treat to drive to to the airport for a drink or a coffee with friends. 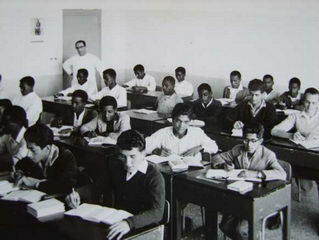 A class at Comboni College. 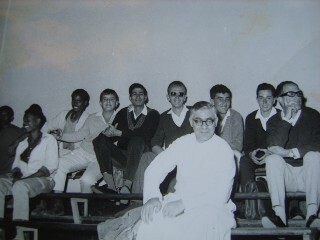 In the picture Father Cremonesi with his students..amongst them Nuru Moledina, Santarosa, Apostolidis, Kanzen, Keckia, Bamousmous and many others. A day outing to Massawa with friends.This picture features the Dogali Bridge on the way to Massawa. 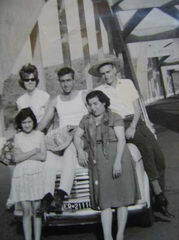 In the picture Petros Condomathios with his sister, his niece Antonia and Costas Stylianidis (in the big hat) and his sister Georgia. 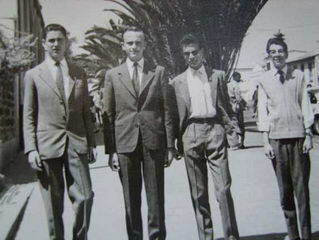 A stroll with friends on sunday morning after church, dressed in our best clothes, looking to impress the girls.. Abrate, Levi, Costas and....? A quick escape by car with friends to Nefasit. 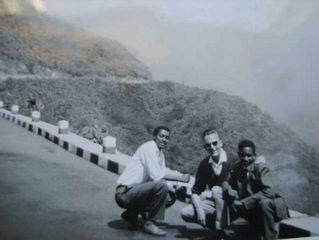 Here with friends Omar Keckia and Haile Hailemariam outside Arbaroba which is about 12 kilometers outside Asmara. At the port of Assab, as the m/v Yohomama Maru is berthing.. Costas, Takis Christoforakis and Dimitris Kavadias. 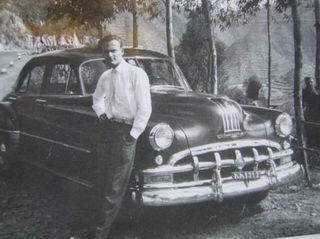 A sunday drive to Dorfu with the Pontiac borrowed from of beloved brother Lefteris! 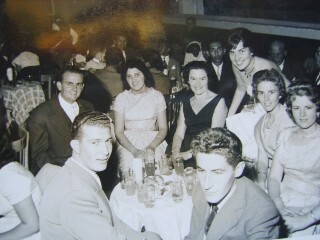 I got these pictures from a friend who now lives in Athens.. can you recognise yourself? 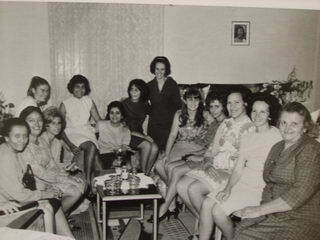 I can see Loredana, Polixeni, Sia, Maria Kyriakakis, Theodora Derviniotis, Fotini (Mulligan) Elenitsa Stylianidis mum Despina and many others.. 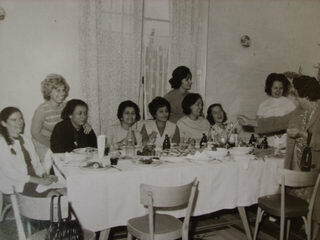 In the 60s it had become a regular habit for the 'girls' to meet at one of their houses for a 'Berbere afternoon'! 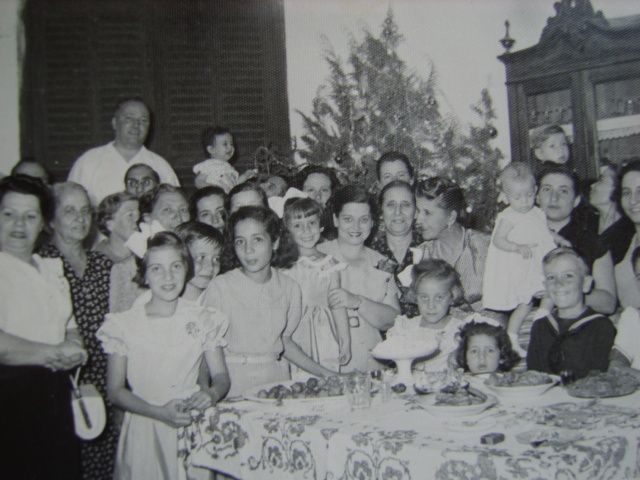 Here we can see Theodora Maltas, Kyria Georgia, Maria Kyriakakis, Theodora Derviniotis Elenitsa Stylianidis and a few others whose names I cannot remember. This photograph was taken after a School Sketch in the 60's . 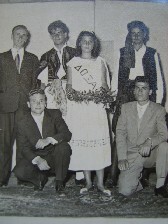 Nikos Maltas, Nikos Garoufalias, Ioulia Bourboulis, Billy Apostolidis, Costas Nikoloudis and Costas Stylianidis. 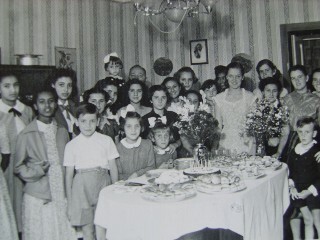 Another birthday party at Panas' house in Massawa.. Can you put a name to these faces? 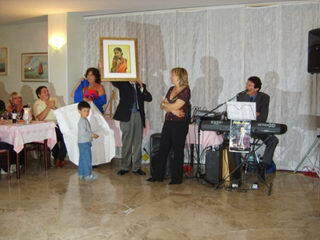 'Auntie' Rosalia, Mountzi, Aglaia Pana?? 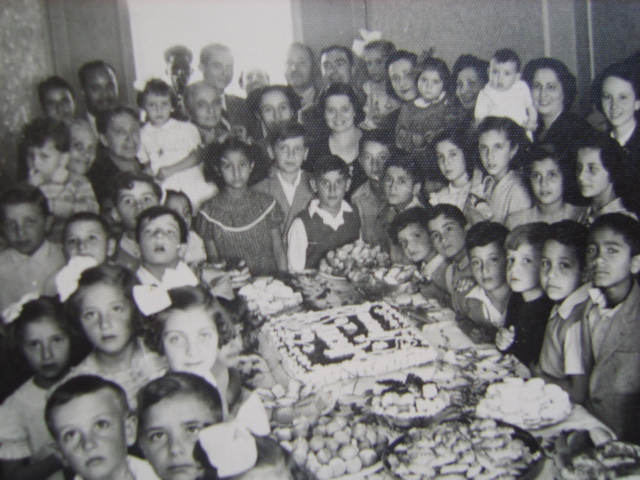 A birthday party at the Papafilipou house.. any names? Celebrating New Years' Eve at the Gruppo Sportivo Asmara with Lefteris, Pola and Georgia Stylianidis, Tina and mother Georgia Vadala, Franco Pantalona and others...?? 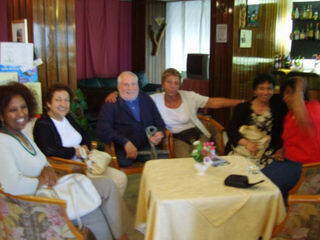 Here are some friends from Comboni, Elena, Molinari, Abrate, ?? It was 'Carnevale' and in this party we can see Singarella, Petros Condomathios, Costas, Ferrucio Feo, Fenili and a few others ???? Please let me have their names if you know them! On Easter Monday we would all have a picnic at 'Vale Gnechi' where there was the lake supplying Asmara with its main water requirements. 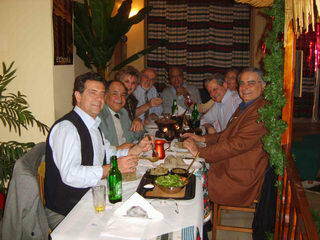 Here you can see Vanghelis Bourboulis, George Tsakonas, Lefteri Stylianidis and some I do not know the names of. Memories of good days gone by. This photo was received from a friend. 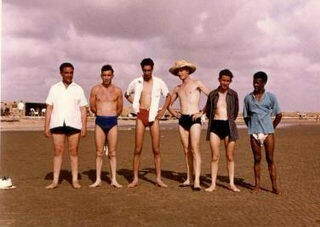 The picture was taken in the 60's at the Gurgusum Beach which in those days was just a long and deserted sandy beach. It was not unusual to pitch camp on the beach with a makeshift tarpaulin and sleep rough on the sand only to be awakened during the night, by little crabs reclaiming their territory. 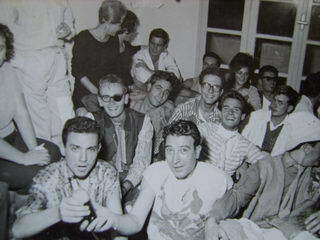 In the picture are Mario Tonellotto, Luigi Molinari, Costas Stylianidis 'Canone' and a few more friends whose names have faded away from my memory ! 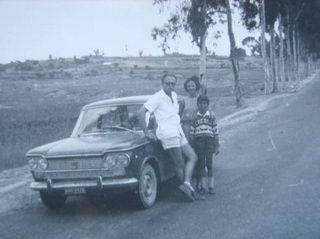 Driving from Assab to Asmara with sister Helen and son Orestis, this picture was taken outside Adiugri in 1967. And of course more memories from a picture sent to me by a friend. 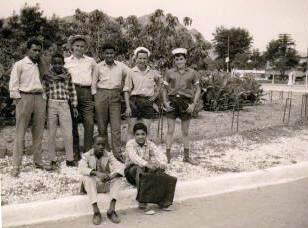 It is a picture that I remember vividly, having being taken during a school outing when we were going to Comboni College, to Keren. In the picture I remember Esposito Dante, Santarosa, Abdeluahab, Luigi Molinari, Elena, George Mitsopoulos , Adriano Abrate and ??. 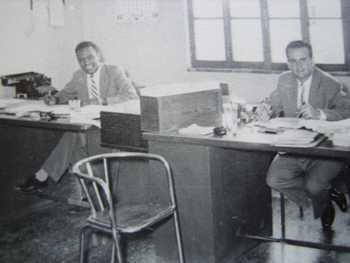 Colleagues in the 60s, working for Gellatley Hankey in Asmara! 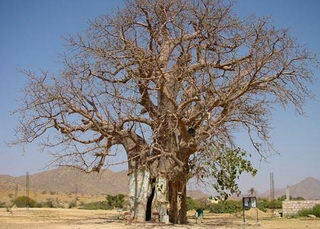 This is the real Baobab tree in Keren in which a burned shrine of the Madona was found and today it is a place of pilgrimage and worship.